The 2019 Toyota RAV4 doesn't have quite as much cargo space as its predecessor, but let's take a closer look to see what's still left. 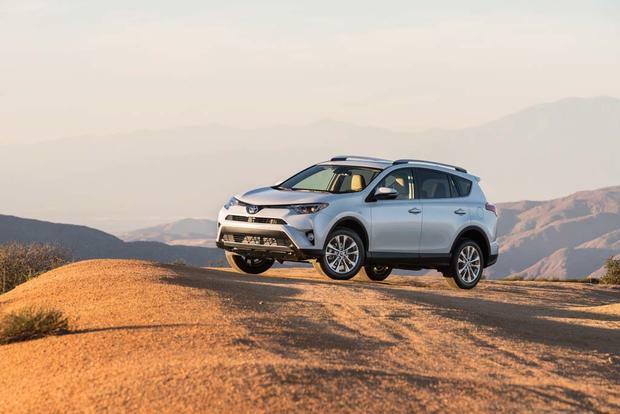 Video | How Is the 2019 Toyota RAV4 Adventure Different? The 2019 Toyota RAV4 Adventure trim level is of the biggest updates for this redesigned crossover and we show you how it's so different. 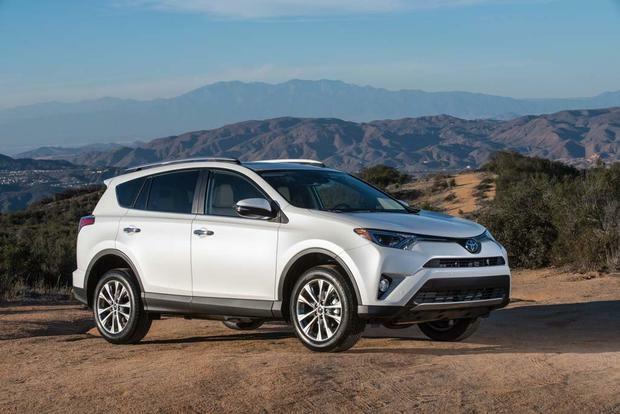 The 2019 Toyota RAV4 Hybrid is completely redesigned this year and is arguably the better choice for most buyers than the regular RAV4. The 2017 Toyota RAV4 doesn't really stand out in a crowd or rise above its top competitors, but then again, it's hard to argue with its reasonable pricing, impressive fuel economy, high resale values, huge interior and a strong reliability record. It's a utility-oriented small SUV that does just about everything you'd expect, and for 2017, it goes a bit further with newly standard collision-avoidance tech. So we definitely think the RAV4 is a strong competitor and worthy of a spot on your shopping list as you consider a new compact crossover -- especially the unique RAV4 Hybrid. It's just that its competitors, and specifically the all-new Honda CR-V, match or surpass the RAV4's talents while adding some more emotional appeal. In other words, make sure to look around a bit. For 2017, every RAV4 comes standard with the Toyota Safety Sense package, which includes forward-collision warning and automatic braking, lane-departure warning and intervention, adaptive cruise control and automatic high beams. There is also a new range-topping Platinum trim level. 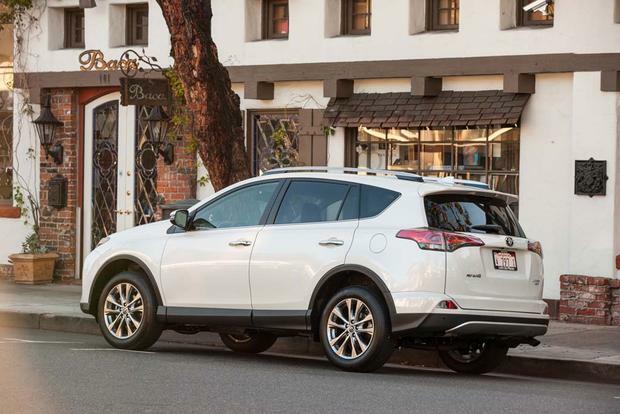 The regular 2017 RAV4 comes only with a 176-horsepower 2.4-liter 4-cylinder mated to a standard 6-speed automatic and front-wheel drive. All-wheel drive is optional. Fuel economy does differ slightly by trim, but with front-wheel drive, the volume-selling LE and XLE return 23 miles per gallon in the city, 30 mpg on the highway and 26 mpg in combined driving. All-wheel drive effectively reduces those figures by 1 mpg. The RAV4 Hybrid uses a 2.5-liter hybrid 4-cylinder mated to a battery pack and a pair of electric motors front and rear that effectively create standard all-wheel drive. Total output is 194 hp. Fuel economy is 34 mpg city/30 mpg hwy/32 mpg combined. 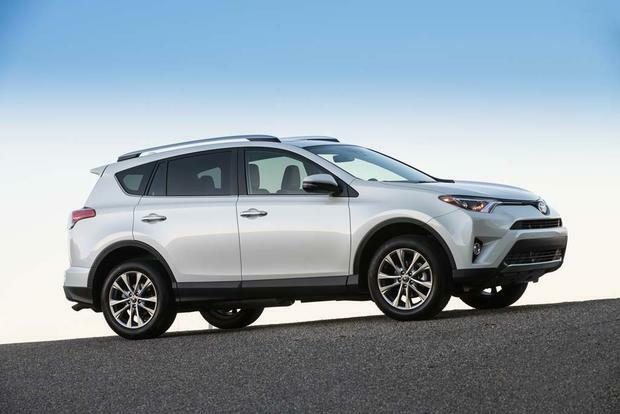 The standard RAV4 is offered in LE, XLE, SE, Limited and Platinum trim levels. The Hybrid comes in XLE, SE and Limited trims, which pretty much align with their standard counterparts. Shoppers who choose the RAV4 LE ($24,900) get 17-in steel wheels, rear privacy glass, air conditioning, a backup camera, adaptive cruise control, forward-collision warning and automatic steering, lane-departure warning and intervention, automatic high beams, a height-adjustable driver's seat, Bluetooth, a USB port, a 6.1-in touchscreen and a 6-speaker sound system. 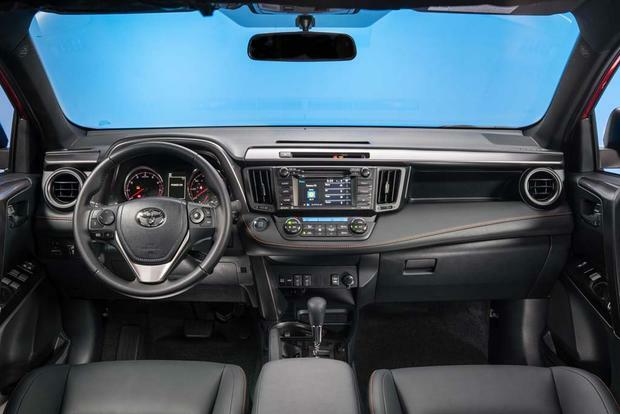 Step up to the RAV4 XLE ($26,800) and you get 17-in alloys, a sunroof, a height-adjustable power lift gate, dual-zone automatic climate control, fog lights, heated side mirrors, a leather-wrapped steering wheel and the Entune Audio Plus package (optional on LE) that adds satellite radio, HD Radio, a smartphone-app based navigation system and various other smartphone connection apps. The sporty SE ($30,000) adds 18-in alloy wheels, revised exterior styling, a sport-tuned suspension, automatic LED headlights, passive entry and keyless start, a power driver's seat, SofTex vinyl upholstery, heated front seats, blind spot monitoring and rear cross-traffic alert systems (optional on XLE), steering-wheel paddle shifters and memory settings for the driver's seat. The Limited ($31,900), which loses the SE's sporty styling cues and suspension but keeps its other equipment, adds chrome wheels, auto-dimming mirrors, a 7-in touchscreen and a navigation system with smartphone integration. The Platinum ($34,800) gains a hands-free power lift gate, special exterior trim, a 360-degree parking camera, a heated steering wheel, special interior trim and an 11-speaker JBL sound system (optional on the SE and Limited, not available on the Hybrid). No other compact crossover can top the 2017 RAV4's standard safety equipment. Besides the usual content of antilock brakes, stability control, front side airbags, side curtain airbags and a rearview camera, it boasts a driver knee airbag, a front passenger under-cushion airbag, forward-collision warning and automatic braking, and lane-departure warning and keeping. Blind spot monitoring and rear cross-traffic alert systems are standard on the SE, Limited and Platinum, and optional on the XLE. 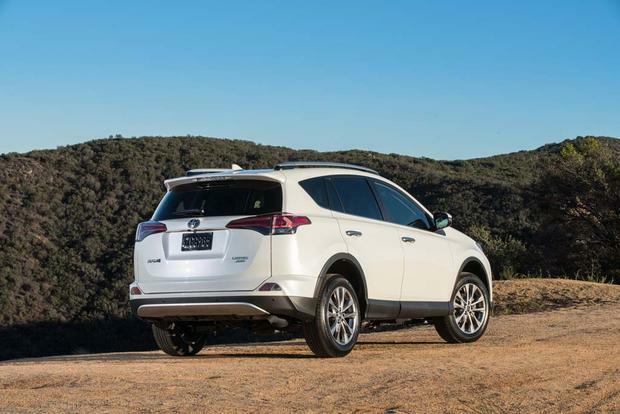 In crash testing carried out by the federal government, the RAV4 earned a perfect 5-star overall rating. 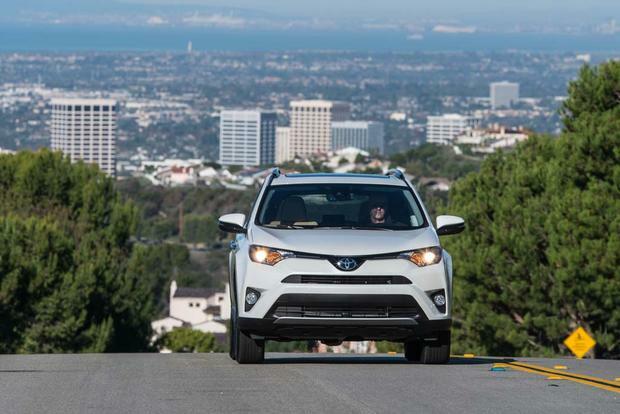 In tests carried out by the nonprofit Insurance Institute for Highway Safety, the RAV4 garnered an impressive Top Safety Pick+ score after earning strong ratings in all the firm's crash tests. Overall, the RAV4 rides and handles very well, especially considering its tall ride height. The electric power steering is reasonably precise and provides good feedback in tight turns. Likewise, the suspension soaks up most bumps yet doesn't allow the car to lean or bob about uncontrollably when pushed hard (we would think twice about the available 18-in wheels, though, which can add impact harshness). In the end, however, like the rest of the RAV4, the handling is simply outdone by that of competitors. The Honda CR-V in particular is more responsive, comfortable and refined to drive, with a stronger and more efficient engine to boot. The Mazda CX-5 and Ford Escape are also more responsive to drive. 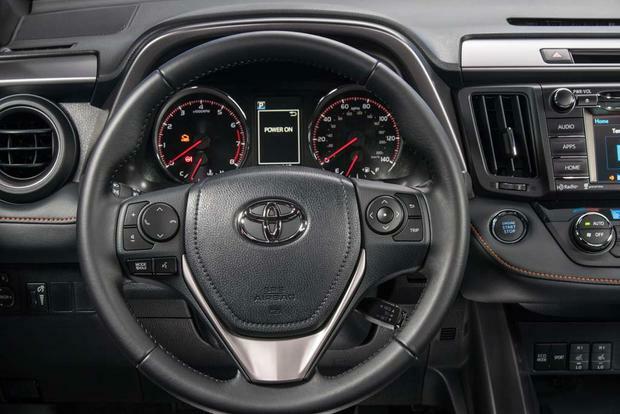 The RAV4's interior is also a mixed bag. On the upside, it has easy-to-use technology and it matches the CR-V's huge back seat and enormous cargo area. The latter also boasts a low load height, which is great for lifting in heavy objects or having the dogs jump aboard. Apart from some questionably useful interior storage bins, the RAV4's functionality is hard to fault. 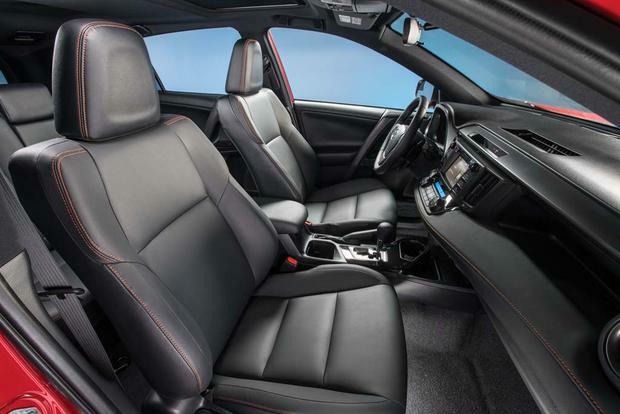 Unfortunately, its cabin materials consist of disappointing black plastic, and the SofTex vinyl upholstery found on most trims won't fool anyone into thinking it's leather (which isn't available at all). The overall appearance and vibe also feels a bit Spartan compared to those of the surprisingly upmarket new CR-V and CX-5. These competitors quite simply seem more grown up than the RAV4. 2017 Honda CR-V -- The all-new CR-V is the SUV to beat in this segment. It takes every drop of functionality its predecessor possessed and adds a thick shellac of refinement. Read 2017 Honda CR-V vs 2017 Toyota RAV4: Which is Better? 2017 Mazda CX-5 -- The CX-5 is also all-new for 2017 and, like the CR-V, builds upon its successful predecessor. It's a more responsive vehicle to drive than the RAV4 and arguably more visually appealing, but can't match the Toyota's utility. 2017 Ford Escape -- The Escape's updates for 2017 weren't quite as substantial, but they nevertheless improved its technology and interior versatility. The Escape continues to be sharper to drive than the RAV4 and offers a more powerful engine option. Used Toyota Highlander -- If you like the RAV4 but want a larger vehicle, you might want to consider the Toyota Highlander, which offers a comfortable ride, Toyota reliability and 3-row seating. They're expensive when new, but a used model is a worthy competitor to the RAV4. Here's something we don't say very often: The Hybrid could make the most sense. Considering you should save an estimated $300 per year at the pump, its roughly $800 price premium will be quickly paid back. Either way, though, we would recommend driving both the SE and Limited, then get whichever one you prefer (their suspension and styling differ). Each offers a commendable amount of desirable equipment at a fair price.